ABSTRACT / 101 years have passed since the Russian Revolution of 1917 that destroyed the Russian Empire and changed the landscape of the world politics forever. 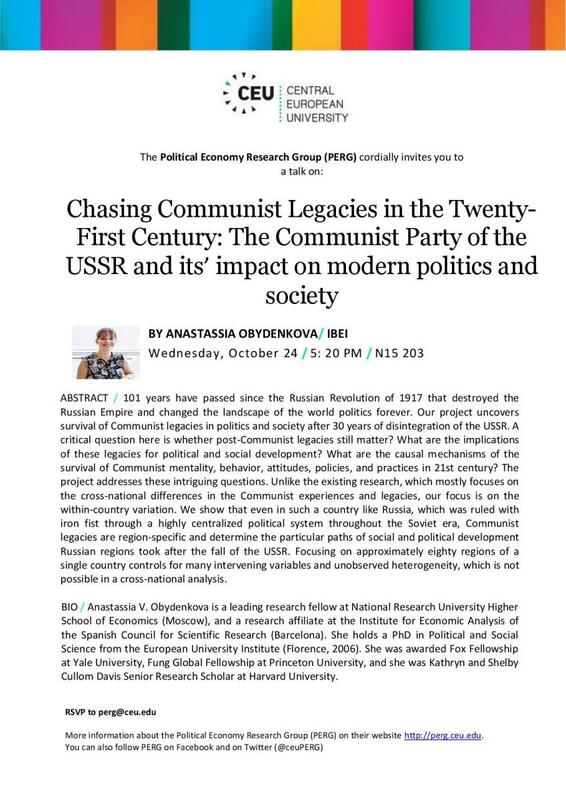 Our project uncovers survival of Communist legacies in politics and society after 30 years of disintegration of the USSR. A critical question here is whether post-Communist legacies still matter? What are the implications of these legacies for political and social development? What are the causal mechanisms of the survival of Communist mentality, behavior, attitudes, policies, and practices in 21st century? The project addresses these intriguing questions. Unlike the existing research, which mostly focuses on the cross-national differences in the Communist experiences and legacies, our focus is on the within-country variation. We show that even in such a country like Russia, which was ruled with iron fist through a highly centralized political system throughout the Soviet era, Communist legacies are region-specific and determine the particular paths of social and political development Russian regions took after the fall of the USSR. Focusing on approximately eighty regions of a single country controls for many intervening variables and unobserved heterogeneity, which is not possible in a cross-national analysis. BIO / Anastassia V. Obydenkova is a leading research fellow at National Research University Higher School of Economics (Moscow), and a research affiliate at the Institute for Economic Analysis of the Spanish Council for Scientific Research (Barcelona). She holds a PhD in Political and Social Science from the European University Institute (Florence, 2006). She was awarded Fox Fellowship at Yale University, Fung Global Fellowship at Princeton University, and she was Kathryn and Shelby Cullom Davis Senior Research Scholar at Harvard University.